Gurudwara Sri Hemkund Sahib : Hemkund Sahib (also known as Hemkunt Sahib), is situated in Himalayas at Hemkund Parbat on Hemkund Lake, the "lake of ice" covered by "seven peaks" on all sides with each peak adorned by a Nishan Sahib on their cliffs. It is in Chamoli district of Uttrakhand state of India at the height of 15200 ft.
Hemkund is a Sanskrit name derived from Hem meaning Snow and Kund meaning Pond. The route to Hemkund is covered by snow most of time of the year but is managebale to cover by foot from Ghangaria or Gobind Ghat (7 kms) from June to September end as it is Summer & Monsoon periods when snow melts for a small time. Gobind Ghat is further manageable from Govind Ghat (13 kms) on foot. For visiting Hemkund, Govind Ghat is connected with Road on Rishikesh-Badrinath Highway. Hemkund Sahib is linked with Sri Guru Gobind Singh, the tenth Guru of Sikhs, As per his composition 'Bachitar Natak' of 'Dasam Granth', Guru Gobind Singh is believed to have meditated in his previous life at Hemkund. "Ab main apnee katha bakhaano. Tap saadhat iih bidh muhe aano. Hemkunt Parbat hai jahaan, Sapt sring sobhit hai tahaan .1.
teh ham adhik tapasaya sadhi. mahakaal akalka aradhi .2." "I shall now relate my own story, how God sent me into this world. I was busy performing penance on the hills of 'Hemkunt' where seven peaks are prominent. The place is called 'Sapt Shring’ where King Pandu had performed Yoga, there I practised austerity and worshipped the god of death." Sri Hemkund Sahib is accessible only in the summer, between June and October every year. The rest of the year, Hemkund remains covered with heavy snow. Gurudwara Sri Paonta Sahib : Surrounded by the Sal forest and on the bank of river Yamuna the historic town of Paonta Sahib was founded by the tenth Sikh Guru Govind Singh Ji. When only sixteen years old, the guru left Anandpur Sahib and on the invitation of Raja Maidini Prakash of Sirmour, lived at this beautiful place for over four years. The historic gurudwara commemorates his stay and interestingly the waters of the Yamuna fall silently below this -which happened at the Guru's behest. The word 'Paonta' means 'Space for a foot hold'. Hemkund Sahib Yatra is done between June 1 and Oct 5 every year. Day 1 : Drive Delhi to Rishikesh visiting Gurudwara of Rishikesh, night at Rishikesh Hotel. Day 3 : Drive from Joshimath to Govind Ghat and Car will be parked here. Start Trekking (13 kms)for Govind Dham, night at Govind Dham hotel. Day 4 : Start Trekking from Govind Dham to Hemkund Sahib and return back to Govind Dham after Darshans of Hemkund Sahib(Trek 6 x 2 =12 km), night at Govind Dham hotel. Day 6 : Drive from Rudraprayag to Rishikesh, night at Rishikesh hotel. Day 7 : Drive for Paonta Sahib. After Darshans of Paonta Sahib, drive for Delhi and reach Delhi late evening. For 8 persons : Rs 19500 Per Person on Double sharing Room. - Family Hotel Accommodation at Rishikesh, Rudraprayag & Joshimath for 4 Nights. - Basic Accomodation at Govind Dham for 2 nights. We can organise Hemkund Sahib Tour from Amritsar and Chandigarh Also. Please write us your requirements. * The Gurudwara has linkages to the tenth Sikh Guru, Guru Gobind Singh and the Sikh leader Banda Bahadur. Its original name was Paontika. "Paon" in Hindi means feet and "tika" in Hindi means became stable. It is believed that Guru Gobind Singh's horse stopped at this place on its own and he decided to stay here. * The place was Guru Gobind Singh's home for over four years and it was here that he wrote the Dasam Granth. Sri Dastar Asthan were he judged the turban tying competitions. 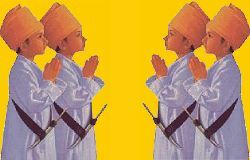 * Gurudwara also houses a museum which contains a lot of antiques and weapons used by Guru Gobind Singh during his stay. * Gurudwara Tirgarh Sahib is built on the hillock from where Guru Gobind Singh shot arrows at the enemy. *Gurudwara Shergarh Sahib place is the place where Guru Gobind Singh beheaded a dangerous man eater tiger with a single swipe of this sword. * Gurudwara Bhangani Sahib commemorates Guru Gobind Singh's first battle when he defeated Raja Fateh Sahib and his allies.